In his book 'The Ruined Abbeys of Yorkshire' William Howitt begins with a criticism of the “Dryasdust” style of historical writing used by topographers by which one gets “the bare bones of the chief facts, and nothing but the bare bones; no flesh, no muscle, no skin, no beautifying colour and life." He quotes at length from William Wordsworth’s poem ‘The White Doe of Rylstone or The Fate of the Nortons’ which the poet composed after a visit to Bolton Priory and the surrounding countryside during the summer of 1807. 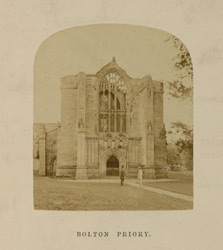 This is one of four photographs by Russell Sedgfield included in this re-issue of part of 'The Ruined Abbeys and Castles of Great Britain' (1862).